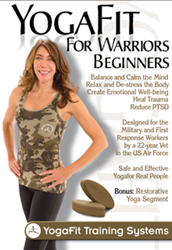 YogaFit is proud to announce the new DVD YogaFit for Warriors. The new program aims at helping military veterans gain the skills and abilities to use yoga to treat PTSD. YogaFit® Training Systems Worldwide is proud to announce the YogaFit for Warriors DVD, a do-at-home yoga class designed for military veterans and families and emergency responders suffering the after-effects of trauma in their lives. YogaFit for Warriors helps calm troubling emotions, thought patterns, chronic tension, and may potentially ease suffering from the result of emotional or physical trauma including Post Traumatic Stress Disorder (PTSD). Carefully designed by YogaFit trainer, Lt. Col. Shaye Molendyke, Yoga Therapist Kristy Manual, and YogaFit founder Beth Shaw, YogaFit for Warriors employs safe, trauma-sensitive yoga to heal a warrior's body, mind and spirit. By using transformational language, slower movements and focused breathing exercises as well as meditation imagery techniques addressing PTSD, this yoga practice aims to ease the mind and body from traumatic brain injury and other common issues that develop in military settings with returning veterans as well as their families. The lessons highlight the somatic component of anxiety and depression while teaching breathing and meditation practices to help relax the body and mind. It also explores restorative yoga postures, breathing techniques and other complementary techniques to soothe the fight-or-flight response. A portion of the proceeds from this DVD will be donated to the Wounded Warrior Project as well as towards scholarship funding to help yoga teachers become certified in YogaFit for Warriors Teaching Training. Military members and spouses will be eligible to participate in YogaFit for Warriors financial assistance through MyCAA and the GI Bill. The new DVD is exclusively distributed by YogaFit and is available through the YogaFit store. For further information visit YogaFit.com or connect at Facebook.com/YogaFit or on Twitter: @YogaFit.